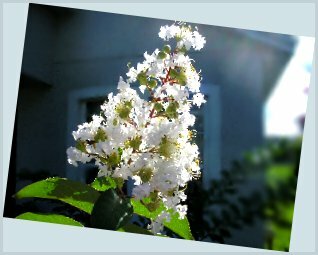 In celebration, I am adding an image ofÂa lovely crape myrtle blossom from the little tree that my husband and I planted in February.Â It was approximately 4 ft. tall and a bunch of dead looking sticks. Okay, I’ve been struck by the quiz bug too. I see I am a Wonder Woman.Â I can’t remember, does she fly?Â Because I want to be a Superhero that can fly. I recommend watching a PBS series of interviews done by Bill Moyers on Faith and Reason.Â My husband and I were able to catch the interview with Salman Rushdie.Â He was captivating and I wonder who his major philosophical influences are. Today is Summer Solstice, the longest day of sunshine (or not, depending on where you live) of the year. Every year I swear that I will get shopping for the last half of the year birthdays and Christmas done early.Â So far my plans haveÂnot completelyÂcome to reality, but that doesn’t stop me! So this morning I am looking at financial planning and making sureÂmyÂplans are in place for the rest of this year and beyond. And just for fun, here’s aÂquiz on figuring out whether you are a Financial Diva (for the ladies of course). who doesn’t deserve it every once in a while! I agree with Joshua that it’s going to be difficult to make a movie as good as the book.Â While it could be an exciting creative adventure, a result anything less than excellent is not good enough.Â I think it’ll be a stressful project. Joshua hasÂalso postedÂmore pictures of my mountains!Â Makes me soooo homesick!